What Side Is Senator Elizabeth Warren Really On? Elizabeth Warren won her race for the U.S. Senate in Massachusetts by claiming to be for the little guy, for the blameless people who were in debt up to their ears to the Big Money guys. Now she is a Senator, appointed to the Senate's Banking Committee. Warren has six years in office without having to worry about getting re-elected. She is free to speak out for the little guy, to speak truth to power, to expose the wrongful acts of the rich and powerful to her constituents (as a member of Congress with the "franking" privilege she can send mail to her constituents for free.) She has no excuse for not doing this. But will she? Elizabeth Warren's constituents in the Boston metropolitan area have been forced to pay stiff fare hikes for, and accept reduced service in, their public transportation system in order to pay back debts that the state government owes to banks. The same kind of thing is happening to Americans in other states. Americans are being told we need to accept savage belt-tightening and budget-cutting in order to pay back public debts. "$16,000,000,000,000.00 had been secretly given out to US banks and corporations and foreign banks everywhere from France to Scotland. From the period between December 2007 and June 2010, the Federal Reserve had secretly bailed out many of the world's banks, corporations, and governments. The Federal Reserve likes to refer to these secret bailouts as an all-inclusive loan program, but virtually none of the money has been returned and it was loaned out at 0% interest. Why the Federal Reserve had never been public about this or even informed the United States Congress about the $16 trillion dollar bailout is obvious - the American public would have been outraged to find out that the Federal Reserve bailed out foreign banks while Americans were struggling to find jobs. "To place $16 trillion into perspective, remember that GDP of the United States is only $14.12 trillion. The entire national debt of the United States government spanning its 200+ year history is "only" $14.5 trillion. The budget that is being debated so heavily in Congress and the Senate is "only" $3.5 trillion. Take all of the outrage and debate over the $1.5 trillion deficit into consideration, and swallow this Red pill: There was no debate about whether $16,000,000,000,000 would be given to failing banks and failing corporations around the world." Will Senator Warren expose this monstrous theft? Will she explain that our government is being used by bankers and billionaires as a device to take money from our pockets as taxes and put it into their pockets, all in the name of paying back public debts to bankers and bailing out "too big to fail" fraudsters? Will Senator Warren tell her constituents that the government could just tax the billionaires to pay for government services but instead it "borrows" from them and then taxes us to pay the billionaires back with interest? Will she explain that the reason the government doesn't just tax the billionaires is because the billionaires run the country and control the government and it is just a myth that "The People" do? Will Senator Warren explain to her constituents that the billionaires got their billions by theft, made legal by governments they control? Will she explain that the wealth of billionaires does not rightfully belong to them? Will she declare that working people have produced all the wealth of society other than natural resources? Will she challenge the billionaires' claim to own the land, buildings, machines and raw materials that people need in order to do productive labor? Will she challenge their claim, therefore, to own all the wealth that people produce with their labor on that land or with those machines and raw materials? Will she point out that while billionaires pay their workers wages and salaries, that these wages and salaries suffice only to buy back a fraction of the wealth the workers produce? Will she explain that this is how profits are made and where all billion-dollar fortunes come from? Will Senator Warren point out to her constituents that a billionaire may or may not personally contribute some useful managerial labor, but that is not the way he or she ends up owning billions of dollars? Will she assert that nobody can work enough hours to earn billions of dollars as fair pay for their labor? Will she tell the simple truth that nobody’s intellectual contribution is a reason for them to own billions of dollars, and that great ideas are only possible because of the countless ideas of others before them? Will Senator Warren say what needs to be said, that billion dollar fortunes don’t come from honest labor or brainy ideas; they come from legalized theft? Will Senator Warren declare that the American public does not owe anybody money; that the billionaires owe the American public of working people money--all of the wealth billionaires have “borrowed” (actually stolen) from workers over the centuries—trillions of dollars! Forgive me for not holding my breath. The Boston Globe, which was instrumental in helping Warren win her Senate race, has an article today titled, "Elizabeth Warren is prepared to pick her spots," which reports that "Elizabeth Warren is prepared to pick her spots. As a watchdog, she spoke out. But in the Senate, the establishment critic is showing restraint." "Since its founding more than 60 years ago, Israel and the United States have been steadfast, trusted, and reliable allies. I unequivocally support the right of a Jewish, democratic state of Israel to exist, and to be safe and secure. The U.S.-Israel relationship is rooted in shared values and common interests, based on a commitment to liberty, pluralism, and the rule of law. These values transcend time, and they are the basis of our unbreakable bond. "To me, it is a moral imperative to support and defend Israel, and I am committed to ensuring its long-term security by maintaining its qualitative military edge. Israel must be able to defend itself from the serious threats it faces from terrorist organizations to hostile states, including Iran, Hamas, Hezbollah, and others." The American ruling class supports Israel for the same reason that it uses the government to enrich billionaires like themselves at the expense of the American public. 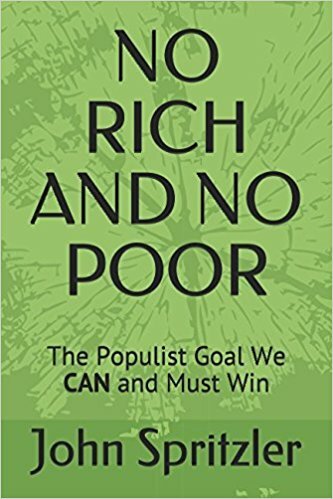 It is all about strengthening the wealth and power of the rich and controlling the rest of the population by diverting their fear and anger away from the rich and focusing it instead on a bogeyman enemy. Today's bogeyman enemy is "Arab/Muslim terrorists." Israel's role in making the Orwellian War on Terror credible is to produce a credible bogeyman enemy, which it does by violently removing Palestinians from the 78% of Palestine that is called Israel and refusing to let these millions of people return, while brutally oppressing Palestinians in the West Bank and Gaza in the name of defending "Israel's right to exist," which means Israeli leaders' right to commit ethnic cleansing to ensure that the population of Israel is always at least 80% Jewish so that it will be a "Jewish state" that Israel's leaders wrongfully tell Jews is necessary for Jews to live safely on the planet. Israeli ethnic cleansing is a key element of the strategy of elite social control, a strategy that politicians unconditionally support as a condition for remaining in the good graces of the dictatorship of the rich with the real power in the United States. The day Elizabeth Warren speaks truth to power about the debts Americans are being forced to pay to the rich will be the same day she abandons her support for Israel's ethnic cleansing; it will be the day Elizabeth Warren decides that she is on the side of the American working class and not on the side of the billionaire ruling class. I do not advise holding your breath waiting for that day to arrive. Instead, I suggest that it is time for us to start Thinking about Revolution.